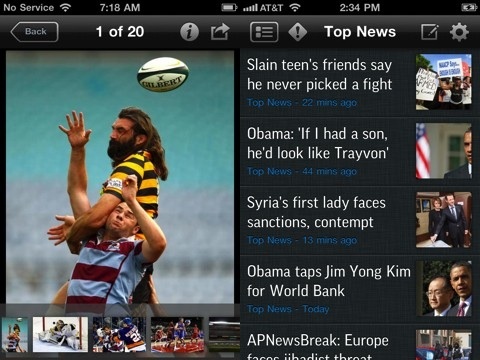 AP Mobile is a universal news app for iPhone, iPad, and iTouch. The Associated Press is a non-profit cooperative owned and operated by a collective of contributing news media companies which has been active since 1846. AP stories are utilized by thousands of newspaper, television, and radio broadcasters around the world. It is, as it likes to boast, where “the news gets it news,” and is among the highest trusted news sources of the world. The newest version of the app offers new features and cosmetic improvements. The old AP Mobile app somehow managed to have a relatively simple yet busy layout. A white background with a scrolling time-line of thumbnail photos and headlines covered the majority of the screen, but the remaining space was cluttered by multiple menus for selecting features like news by category, local news, deals, and settings. The newest version addresses all of these issues: The simplified home screen now has a single, small menu bar at the top, leaving more room for larger headlines in the time-line. The background color is customizable between a textured charcoal and an ashy gray. A single button pulls out a hidden side-screen window where previously separated features have been stream-lined into one easy to navigate menu. Together, these enhancements translate to an over-all improvement in user experience. In today’s world news stories are often captured in the photos and videos of witnesses and bystanders. A great new feature of AP Mobile, called ‘Send a News Tip’, utilizes this new trend by allowing users to send a message with information, media, and the GPS coordinates of breaking news stories as they’re witnessed. There is still a feature to allow AP Mobile to send notifications of breaking major news stories to your device so you can stay informed of major events as they happen. Previously selecting the notification would only take you to the AP Mobile home screen, and there would be no option to read the notification again. Since the notification is a brief sentence and not necessarily a full article information on the story might not show up on the recent news feeds and cannot be easily found. In the new version you can see the headline scroll by in a red bar towards the top. The new ‘Big Stories’ category is also a good addition, adding an organized list of major topics of interest ranging from election campaigns to sports to foreign policy. The new AP Mobile app improves on what was already an excellent news app. 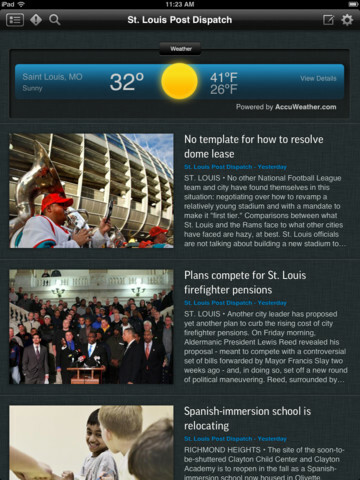 It is a great free app for anyone looking stay informed on current events. AppSafari review of AP Mobile was written by Neema Akhtar on April 20th, 2012 and categorized under App Store, Free, iPad apps, News, Universal. Page viewed 3477 times, 1 so far today. Need help on using these apps? Please read the Help Page.